Summary: We report the case of a 72-year-old man with bilateral intrathoracic carotid bifurcations associated with a Klippel-Feil anomaly. The left and right carotid bifurcations were located at levels corresponding to the second and fourth thoracic vertebrae, respectively. A possible association between low carotid bifurcation and the Klippel-Feil anomaly is suggested. The level of the common carotid artery (CCA) bifurcation into the internal and external carotid arteries is subject to individual variation. The bifurcation is most commonly located between the C3 and C5 vertebral levels, but extreme positions ranging from C1 to C7 may be encountered (Table) (1). Bifurcation of the CCA within the thoracic cavity is an extremely rare anatomic variant, with only four radiologic observations previously reported by Vitek and Reaves in 1973 (2) and Brill and coauthors in 1987 (3). We describe a patient with bilateral intrathoracic carotid bifurcations associated with a Klippel-Feil anomaly. A 72-year-old male patient with a history of cervical spondylosis secondary to a Klippel-Feil anomaly presented with a progressive loss of balance and broad-based gait. The patient also described episodes of light-headedness and dizziness, which eventually resulted in a fall. A Doppler sonographic study performed at another institution revealed reverse flow in a vertebral artery (VA), raising the suspicion of a subclavian steal syndrome. The patient was referred to us for further cerebrovascular evaluation. Digital subtraction angiography (DSA) was performed using biplane angiographic equipment via a right femoral approach. An aortic arch angiogram obtained prior to selective supraaortic studies showed no evidence of subclavian steal syndrome. The innominate artery normally bifurcated into the right subclavian artery and the right CCA. The latter, however, was extremely short, measuring approximately 1.5 cm in length before dividing into the right internal and external carotid arteries. The right carotid bifurcation was therefore in a thoracic location, at a level corresponding to T4 (Fig 1A and B). At the bifurcation, the internal carotid artery (ICA) was posterior and medial to the external carotid artery (ECA). The right ICA and ECA were otherwise unremarkable except for their unusual length. Angiograms of the left CCA showed that the left carotid bifurcation was also intrathoracic, at a vertebral level corresponding to T2 (Fig 1C). 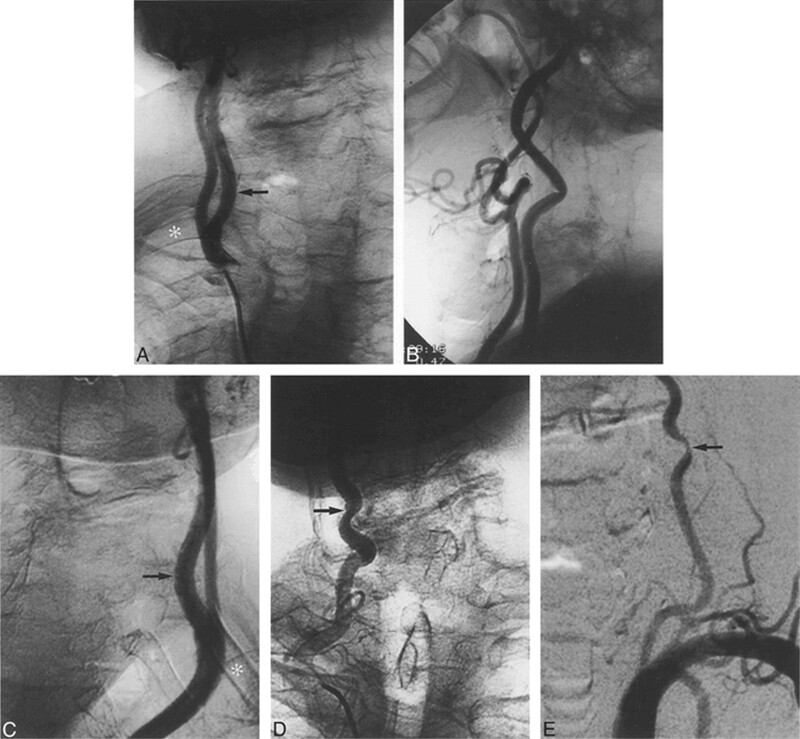 At the bifurcation, the ICA was posterior and medial to the ECA; these arteries were otherwise normal. The subclavian arteries and the origin of the VA were normal bilaterally. Both VAs were patent, with a right-sided prominence. Wall irregularities with lumen narrowing were observed in the mid-cervical portion of both VAs, secondary to bony impingement caused by severe degenerative changes at the C7–T1 level (Fig 1D and E). The stenosis was more pronounced on the left side (70%) than on the right (50%). The vertebrobasilar system was otherwise unremarkable. The capillary and venous phases of both anterior and posterior circulation studies were normal. Fusion of the cervical vertebrae between C1 and C2 and between C5 and C7 was clear on unsubtracted images. A, DSA, right CCA injection, unsubtracted AP view. Carotid bifurcation projects over posterior arch of right fourth rib (star). Note medial position of right ICA distal to bifurcation (arrow) and severe degenerative changes at C7–T1. B, DSA, right CCA injection, unsubtracted lateral view. Because of its intrathoracic location, the carotid bifurcation could not be properly imaged on a lateral view. Standard lateral neck view shows unusual length of ICA and ECA. ICA is kinked at C2–C3. Note fusion of the C2 and C3 vertebral bodies. C, DSA, left CCA injection, unsubtracted AP view. Left carotid bifurcation projects over posterior arch of the second rib (star). Here also, note medial position of ICA distal to the bifurcation (arrow). D, DSA, right VA, unsubtracted AP view. See impingement of right VA at C7–T1 level due to severe degenerative changes secondary to the Klippel-Feil anomaly, with lumen narrowing of approximately 50% (arrow). E, DSA, left subclavian artery, AP subtracted view. VA is also narrowed by C7–T1 degenerative changes, with a lumen narrowing of approximately 70% (arrow). Intrathoracic bifurcation of the CCA is a very rare anatomic variant. Four radiologic observations have been previously reported, with carotid bifurcation levels ranging between T1 and T3 (2, 3). Low bifurcations were present bilaterally in two of these patients and unilaterally in one. The fourth patient was investigated on one side only. Our patient presented with bilateral thoracic bifurcation at T4 on the right side and T2 on the left. Both CCAs were shortened in our case, measuring approximately 1.5 cm on the right and 8 cm on the left; normal values are 9.5 and 14 cm, respectively (1). A similar finding was mentioned in anatomic reports of low carotid bifurcations (4) but not observed in the cases described by Vitek and Reaves (2). The relative position of the ICA and ECA at the bifurcation was also unusual in our case, the ICA being posterior and medial to the ECA on both sides. According to Teal and coauthors (5), this characteristic is found in 8% of cases. Our patient was followed up for a Klippel-Feil anomaly, which caused the fusion of several cervical vertebral bodies and severe secondary degenerative changes. Vitek and Reaves (2) do not mention associated pathologic abnormalities in their patients, and the figures illustrating their report show no evidence of cervical spine anomalies. On the other hand, the presence of a low carotid bifurcation (ie, T2) in a patient with a Klippel-Feil anomaly has been reported by Brill et al in 1987 (3). Although an association between the Klippel-Feil anomaly and low carotid bifurcations seems to be suggested by such observations, the number of documented cases remains insufficient to draw a significant conclusion at the present time. The occurrence of a low carotid bifurcation seems to be embryologically related to the persistence of the ductus caroticus; that is, the segment of dorsal aorta located between the third and fourth aortic arches (4) (Fig 2). The carotid axis normally takes its definitive aspect after involution of the ductus caroticus, which begins at the developmental stage IV (12–14 mm embryo) (6). The CCA and the proximal ICA are then constituted by the proximal and distal segments of the third aortic arch, respectively. Two mechanisms may account for the formation of the carotid bifurcation (4). It is generally accepted that the precursor of the ECA trunk, the ventral pharyngeal artery, arises from the aortic sac and secondarily migrates toward the third aortic arch to constitute the carotid bifurcation. Alternatively, it has been proposed that the ventral pharyngeal artery arises directly from the third arch at the location of the future carotid bifurcation. In both cases, persistence of the ductus caroticus associated with partial or complete involution of the third arch will increase the distance separating the CCA and ECA embryologic origins. Migration of the ECA toward the carotid axis might then be incomplete or absent, resulting either in a low position of the carotid bifurcation or in separate origins of the ECA and ICA. The fact that low carotid bifurcations usually occur bilaterally seems to suggest an abnormal developmental pattern rather than a local disturbance at time of embryogenesis. The association of low carotid bifurcations with a Klippel-Feil anomaly is interesting in that it might point to a segmental developmental disorder leading both to the fusion of cervical vertebral bodies and to the third aortic arch anomaly. Interestingly, an association between cervical vertebral fusion and segmental developmental vascular anomalies has been previously suggested (3, 7). Schematic representation of the carotid bifurcation development. A, Normal development of the carotid bifurcation. The third arch (III) constitutes the proximal part of the carotid axis, which is divided into the CCA and proximal ICA either by in situ sprouting of the ventral pharyngeal artery or by its migration from the aortic sac. The distal ICA is formed by the dorsal aorta distal to the ductus caroticus. The ductus caroticus is the segment of dorsal aorta located between the third (III) and fourth (IV) aortic arches. Its regression at the 12–14-mm stage allows the carotid axis to take its definitive appearance. B, Separate origins for the ECA and ICA from the aorta occur when the third (III) aortic arch involutes instead of the ductus caroticus (illustrated on the left side). The same process may occur on the right side, the separate origins for the ECA and ICA arising in that case from the innominate artery. 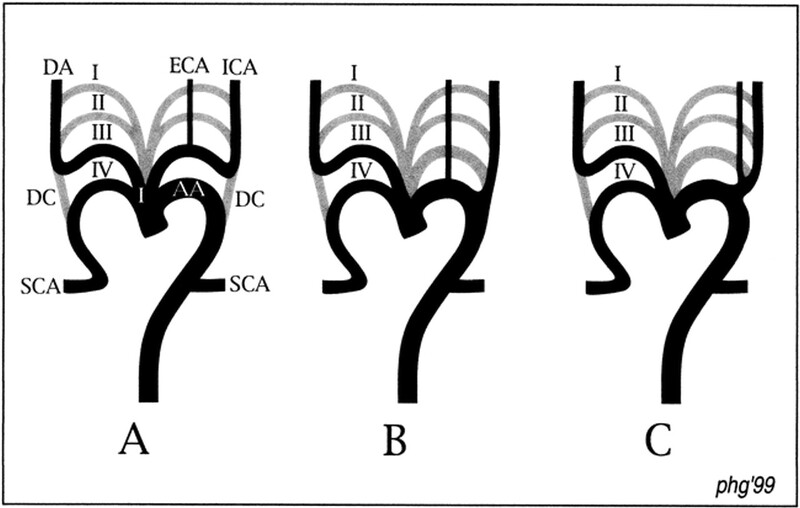 C, Low carotid bifurcations are formed when, in addition to the situation described in B, there is migration of the ECA origin toward the ductus caroticus, and reconstitution of a short CCA. In our case, DSA also showed bilateral segmental narrowing of the VA secondary to advanced degenerative changes associated with the Klippel-Feil anomaly. These stenotic lesions, although of moderate severity (70% and 50% on the left and right sides, respectively), probably account for the vertebrobasilar type of symptomatology described by our patient. VA insufficiency has been correlated with cervical spine degenerative disease (8), and VA occlusion is a reported late complication of the Klippel-Feil anomaly (9, 10). Intrathoracic carotid bifurcations carry a high risk of unintentional catheterization above the carotid bifurcation during conventional cerebral angiography, in particular if they are associated with a very short CCA, as in the reported case. They may also represent diagnostic pitfalls by lying outside the region of interest during cervical MR angiography or being inaccessible to sonographic evaluation. Finally, in the case of atheromatous disease, the intrathoracic location of the bifurcation would render carotid endarterectomy challenging, obliging the consideration of an alternative therapeutic strategy, such as angioplasty and stenting. ↵1 Address reprint requests to Philippe Gailloud, M.D., Interventional Neuroradiology, Department of Radiology and Radiological Sciences, Johns Hopkins Hospital, Baltimore, MD 21287.